The Clinton County Extension Service and Health Coalition sponsored its first Hoops for Health Friday night as the Bulldogs took on the Falcons of Monroe County. 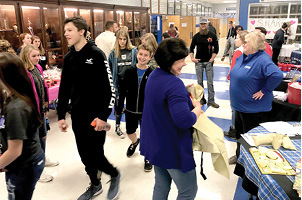 A host of vendors were set up in the Clinton County High School lobby to provide information on a variety of health and wellness topics including weight management, heart health, oral care, health insurance, physical activity options, juuling, and healthy eating habits. The Extension Office also promoted the Plate It Up Kentucky Proud program and would love feedback about any of the recipes folks tried at home. Guffey wanted to give a special thanks to the following vendors: Doctor’s Health & Weight Loss Clinic, The Medical Center at Albany, Family Medical Centers Healthy Kids Clinic, Aetna, Twin Lakes Family Wellness Center, State Farm, and the Clinton County Health Department.